Last week in my post, Let’s just chat, I talked about having a Greenhouse challenge and a few people were really eager. In fact, some gals have even started the challenge already and sent me some pics. I usually do it only once a week but I want to increase doing it to at least 4 times a week. To read how I incorporate the greenhouse effect into my regimen, please read HERE. Apply any amount of any natural oil of your choice (e.g coconut oil, olive oil, etc) on your hair. Sometimes, I spritz my hair with a little water before. That way, my hair is moisturized beforehand. Make sure you coat your hair tips too. Decide how you want your hair to be the next day..if you want curls, do twists, bantu knots or braids. If you are just rocking a simple bun, you can just cross wrap your hair or clip your hair up. Place a shower cap or plastic bag over your hair to lock in the moisture from your scalp’s natural oils and heat from your head. This creates a greenhouse steam effect during your sleep which is the best time for your hair growth in this case. You can do it for 2-3hours only if you don’t want your hair too damp. Place a head tie/scarf over your head & shower cap making sure that it’s nice and snug. For best results, you can also wear another hat over your scarf to help produce more heat. If you have a rollerset or flat ironed hair, you can do it the reverse way. Wear your scarf and then your shower cap before you wear the top hat. Leave this on for about 1 to 2 hours so that your hair doesn’t get damp or wet. In the morning, you may find that your hair is a bit damp from the moisture the steam effect created. if your hair feels too oily, you can rinse off the oil and do a co-wash. Dry your hair. 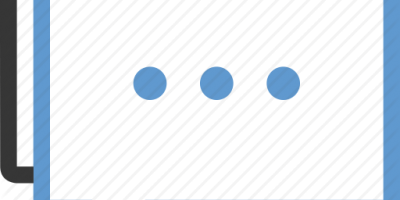 There are 2 levels of the challenge and it will be open to everyone, wherever you are. I will just mail your gift. 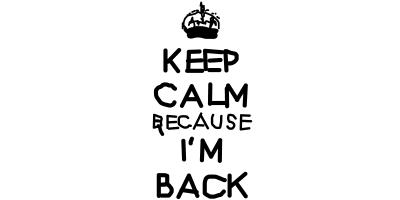 It will run from Monday, November 11th 2012 to Sunday, January 13th 2013. On days that I don’t do the Greenhouse effect, I will just do my regular moisturizing and sealing; I might also apply Lavender Jamaican Black Castor Oil on my scalp if I feel like it. I will co-wash my hair about 2 times a week and/or when my hair feels too oily. I know some people might wonder how I co-wash so frequently: I will publish a post next week on Co-washing for busy women. Watch out for it! 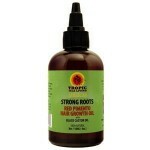 On days I co-wash, I will apply Tropic Isle Living Strong Roots Red Pimento Hair Growth Oil to my scalp while doing the Greenhouse. 45 Comments to Official greenhouse challenge announcement! Your desire for the t-shirt noted dear: I hope it corrects the inverted v too! Am in and knowing how forgetful I can be, I’ll save it on my phone with a reminder. Oh! I forgot to add that I’ll join the level two. What’s the check in period? From now till any time next week I guess. I’ve received your pic! Pls can I use more than one natural oil? 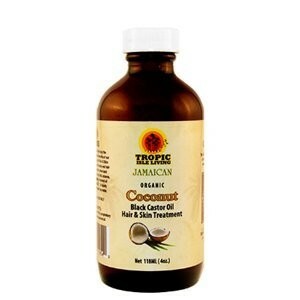 I have braids on right now but would like to try this out to see the effect on my hair when i take out my braids. Should I get all these oils or will olive oil alone be ok? Olive oil is perfect: any natural oil will do. I want in! Excited! I am doing level 2. How do I exactly send my pix and what are you exactly judging this competition? Wao, good things are happening here! I’m in at level one. I’m trying to reduce how often i touch my hair. You will receive my picture by tomorrow. For the length check t-shirt, large size is okay for me. Your hair is really growing very fast. How do u handle tangles when u are in a hurry? Great news to hear that you’re in..still expecting your picture. I will do a random selection of t-shirt winners today. I don’t handle tangles when I’m in a hurry: I pack my hair and smoothen it as best I can till I have the time to detangle it slowly. Thank u for the tip on tangles. Wl send the pic. I am so game! Will send my before picture today. 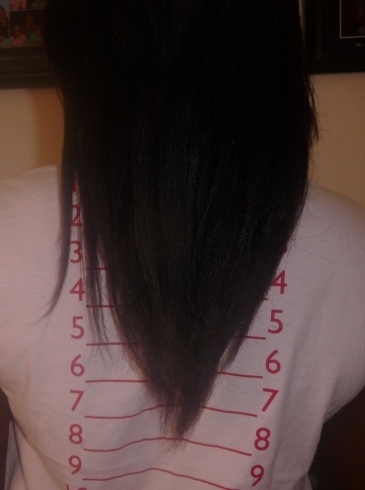 Still interested in getting the length check t shirt. I’ll be doing level two. Not seen your picture yet! Count me in for the level 2! Will send you my pic as soon as i take out my braids! Hurry up and take out your braids!! Great!! Just saw ur starting length: your hair is BEAUTIFUL!! i love natural oils,this is another way to benefit from them.i’ld participate at level 1. I already sent my before picture. Okay… I’ve seen your picture but it’s not clear.. Can you please send a clearer pic? Thanks love! i just sent another.seen it? Pls one question. So we won’t use any shampoo or even black soap to wash our hair throughout the challenge? I’m due for a wash and I wanna be sure I follow the rules. Or better still, what will a typical wash day be like during this challenge? Can you pls give us details? Thank you. Will do a wash day post next week and a hair diary post the following week to make things clearer. Sounds okay? Ok. Thanks. I’ve noticed my moisture level is slightly higher now and my hair flows and feels silky except the new growth. Am glad that you’re enjoying the challenge! I have relaxed hair and it’s cut into a tapered pixie cut but I want to grow it out using this method but it makes my hair wet and I can’t retain any curled style ( with a hair straightener). Normally I curl my hair once a week on a Sunday and it keeps the style till school is finished on a Friday. Any suggestions?